The 30-share Bombay Stock Exchange’s sensitive index crossed the 6300 mark for the first time today, with PSU and bank stocks leading the bull charge. The Sensex opened 48 points higher than the previous close at 6275 to touch an intra-day high of 6,331. Stockbrokers look at monitors at a brokerage firm in Mumbai on Thursday as shares on the Sensex surged past the 6,300-level. The World Economic Forum today said that it was still not easy to start business in India for an overseas investor, even though there was growing interest among transnational corporations to invest in the country. 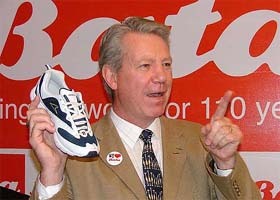 Stephen J. Devis, MD of Bata India Ltd, launches the new range of Bata shoes in New Delhi on Thursday. Bata will come out with a rights issue next year for an equity infusion of $ 12 to 15 million to fund its capital restructuring plans. Directors of Reliance Industries have suggested to the Ambani brothers to sort out their differences by sitting across the table instead of corresponding through e-mail. “We (Directors of RIL) do not find the mode of e-mail suitable. Instead of e-mail, it should be love mail. The World Health Organisation has reinstated two antiretrovirals manufactured by Cipla Ltd., India, in its list of prequalified medicines. The two medicines used in the treatment of AIDS had been delisted by WHO in May this year due to non-compliance with international standards at the contract research organizations hired by Cipla to conduct bioequivalence tests on the products. Mahindra & Mahindra has launched a special offer on Scorpio from December 1 to 20 to celebrate its 2nd anniversary. The Scorpio will be available at the price it was launched at two years ago — for Rs 5.77 lakh. In a bid to check tax evasion, high-value transactions like purchase of property beyond Rs 30 lakh and savings deposits of over Rs 10 lakh will now come under income tax department’s scanner with Government making it mandatory for Registrars and banks to file Annual Information Returns on such transactions this year. The hearing on the Birlas will controversy case at the Calcutta High Court ended today for the time being after the completion of the argument of the counsels in favour of R.S. Lodha against the Birlas’ caveat petition application. The 30-share Bombay Stock Exchange’s sensitive index crossed the 6300 mark for the first time today, with PSU and bank stocks leading the bull charge. The Sensex opened 48 points higher than the previous close at 6275 to touch an intra-day high of 6,331. It closed 100 points higher than the previous close at 6328. 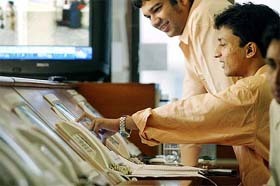 Bullish sentiment also propelled Nifty to gain 37 points or 1.9 per cent to close at 1999. In late afternoon deals, Nifty touched the 2000 level for the first time in 11 months. Stockbrokers attribute the continued bull run to easing of crude oil prices that is powering markets worldwide. Crude prices fell more than $3.50 per barrel on Wednesday. Better still for the local bourses, FIIs seem to have taken a shine for Indian scrips with more than $ 7 billion flowing this year. Banking scrips led the bull run here. The SBI was up Rs 41 or 7.6 per cent to close at Rs 581. Corporation Bank gained almost Rs 52 or 17 per cent to end at Rs 356. Allahabad Bank was up 9.5 per cent. The Bank of Baroda and Canara Bank were up by over 5 per cent each. PSU oil and refining companies gained with international prices sliding. HPCL was up Rs 27 or 8 per cent to close at Rs 370. BPCL moved up by almost Rs 32 or 8 per cent to finish at Rs 431. IOC gained Rs 30 or 6.8 per cent to end at Rs 475. ONGC was up Rs 18.5 or 2.2 per cent at Rs 831. Gail was up 4.5 per cent as the BSE Oil and Gas index was up 3.66 per cent to 3,125. Reliance was again a favourite of punters with the scrip gaining Rs 13.55 or 2.5 per cent to close at Rs 541.80. Reliance Energy gained 1 per cent to Rs 573. The World Economic Forum (WEF) today said that it was still not easy to start business in India for an overseas investor, even though there was growing interest among transnational corporations to invest in the country. “It is still difficult to do business with India. It is not an easy country to start business due to reasons what may be termed as rigidities. The other most important difficulty for doing business in India was lack of infrastructure”, Director for India, World Economic Forum, Ms Colette Mathur, said. At the same time, however, she said there has been growing enthusiasm among international investors for coming to India. This is reflected in the interest shown by corporations and representatives to participate in the forthcoming India Economic Summit organised the WEF in association with the Confederation of Indian Industry (CII). “Never before in 20 years have we experienced so much interest to join us in India. This clearly indicates that the country has become a priority destination for partnership and investment. Directors of Reliance Industries have suggested to the Ambani brothers to sort out their differences by sitting across the table instead of corresponding through e-mail. “We (Directors of RIL) do not find the mode of e-mail suitable. Instead of e-mail, it should be love mail. It is better to sit and talk,” Y. P. Trivedi, Director of RIL and one of the mediators on the spat between Mukesh and Anil Ambani, told Aaj Tak. “One brother should talk to another with love and understanding. Love and feelings cannot be communicated by dry mail. We (directors of RIL) have told them to sit and talk and if there is any need we are here and ready to help,” he said. 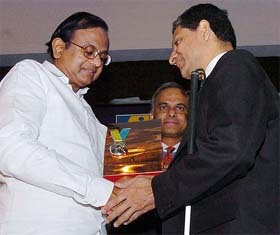 Trivedi felt there could have been a breakdown in communication between the two Ambani brothers. He said entire country is worried, three million shareholders of Reliance are worried, tax collectors are worried and the board is worried as to why and how differences between the two brothers cropped up. “This should not have happened,” Trivedi added. The World Health Organisation (WHO) has reinstated two antiretrovirals manufactured by Cipla Ltd., India, in its list of prequalified medicines. The two medicines used in the treatment of AIDS had been delisted by WHO in May this year due to non-compliance with international standards at the contract research organizations hired by Cipla to conduct bioequivalence tests on the products. The two medicines — Lamivudine 150mg tablet from Cipla Ltd, Kurkumbh, blister pack of 10; and Lamivudine 150mg plus Zidovudine 300mg tablet, Cipla Ltd, Vikhroli, blister pack of 10 — are widely used by patients in developing countries. After being delisted by WHO, Cipla carried out new bioequivalence studies to confirm that the two medicines are as effective as their respective brand-name counterparts. Further WHO scientific assessment and inspections validated the compliance of these new studies, including the CROs involved, with all international requirements. Last month, two other Indian firms, Hetero Drugs and Ranbaxy, opted to withdraw their generic antiretrovirals following similar concerns about laboratory tests. Both companies say they plan to repeat the studies and resubmit the results for consideration by WHO. India, which has the world’s second-largest population infected with HIV, after South Africa, is set to begin human trials of a new vaccine against the virus in January. The country has more than 5.1 million people living with HIV/AIDS. Experts say the number could quadruple by 2010. At the same time, the agency said, it is counting on companies to ensure compliance with international standards at all levels of the prequalification process and accelerate submission of quality data to allow for quick turnaround on assessments and listings. A number of new antiretrovirals, including fixed-dose combinations, are currently in the pipeline for WHO assessment. Mahindra & Mahindra has launched a special offer on Scorpio from December 1 to 20 to celebrate its 2nd anniversary. The Scorpio will be available at the price it was launched at two years ago — for Rs 5.77 lakh. The total benefit to consumers across Scorpio models ranges between Rs 38,000 and Rs 60,000. General Motors India said today it would raise prices next month to meet rising input costs and new emission norms coming into force next year. “We will raise prices on all our models in January 2005 as input costs have gone up and we have to meet the new emission norms next year,” General Motors India Vice-President (Corporate Affairs) P. Balendran said. General Motors sales grew 98 per cent in November 2004 to 2,495 units compared to 1260 the same month last year, largely on account of increased sales of Chevrolet Optra and Chevrolet Tavera. Consolidated sales during January-November jumped 76 per cent to 23,763 units as against 13,505 units during the corresponding period last year, GMI vice-president (Corporate Affairs) P Balendran said in a statement here. GMI, a wholly owned subsidiary of US-based General Motors Corp, sold 605 units of Chevrolet Optra, 1460 units of Chevrolet Tavera and 421 units of Opel Corsa during November. Ford India today announced the launch of a new variant Ford Endeavour with Hurricane Gear in the domestic market as part of efforts to consolidate its position in the fast-growing sports utility vehicles segment. The new SUV comes packed with additional stylish features and is priced at Rs 14.56 lakh (ex-Delhi) for the 4x2 version. The 4x4 version costs Rs 15.56 lakh (ex-Delhi), Ford India vice president (marketing and sales) Vinay Piparsania said in a statement today. “With the new Endeavour, we are able to offer our customers the opportunity to personalise the vehicle with special adventurous gear adding to the imposing, tough profile of the SUV,” he said. Leading carmaker, Honda Siel Cars India Ltd sold 3,409 units in November 2004 as compared to 1,827 units sold during the same period last year, registering a growth of 86.59 per cent. The company’s cumulative sales for the April-November period also grew by a huge 135 per cent from 10,280 units to 24,146 units, a company statement said. In a bid to check tax evasion, high-value transactions like purchase of property beyond Rs 30 lakh and savings deposits of over Rs 10 lakh will now come under income tax department’s scanner with Government making it mandatory for Registrars and banks to file Annual Information Returns (AIR) on such transactions this year. A Finance Ministry notification, issued today, made out seven categories—banks, mutual funds, companies issuing shares as well as debentures, credit card providers, registrars and RBI—who will have to file AIR on high value transactions from this financial year. Credit card payments beyond Rs 2 lakhs, investments in bonds and debentures of over Rs 5 lakh, mutual fund of over Rs 2 lakhs and shares of over Rs 1 lakh would also come under the tax scanner. The Reserve Bank will also be required to file AIR on sale of RBI bonds of Rs 5 lakhs and above to any person, it said. The registrar and sub-registrar would have to file AIR in case of purchase or sale of any immovable property of Rs 30 lakh, it said. Lodha’s lawyer Anindra Mitra argued that the Birlas had no legal documents in their favour on which their caveat petitions could be granted. He prayed to the court to dismiss the caveat petition and instead grant immediately the probate of Ms Priyamvada Devi’s will bequeathing the entire Rs 5,000 crore M.P. Birla’s property to their attorney, R.S. Lodha. The judge, Mr Justice K.J.Sengupta, however, fixed December 15 as the next date of hearing when he would pronounce his judgment regarding Lodha’s plea and declare if Birla’s lawyers could be allowed further time to proceed with their arguments. With Puncom successfully competing in a major BSNL STM-4 equipment tender, as order of Rs 9.34 crore is expected to be placed on the company soon. Ms Ravneet Kaur, Vice-Chairman and MD, Puncom, said today that the tender was won in the face of stiff competition from companies like Marconi, Fibcom and SCL. It was the result of a successful tie-up of Puncom with an upcoming synchronous digital hierarchy (SDH) technology company, Tejas Networks, Bangalore. Australia and Canada are competing for top honours with a study flow of Indian prospects seeking their fortune in these countries. The secret for greater number of Indians flying to Australia and Canada is that Australia has quickened up its immigration process, whereas Canadian visa may take close to three years, says Colonel Sandhu, CMD of WWICS.